Shildon AFC dreams of winning the EBAC Northern League for the first time in 75 years were shattered on Wednesday 29th April 2015 when they were held to a 1 – 1 draw at Bedlington Town. The Railwaymen needed all three points to lift the title. Marske are now champions on 90 points with Shildon one point behind on 89. Prior to kick off the match had been labelled a formality for Shildon as Terriers were in free fall and were winless in 11 games prior to tonight. 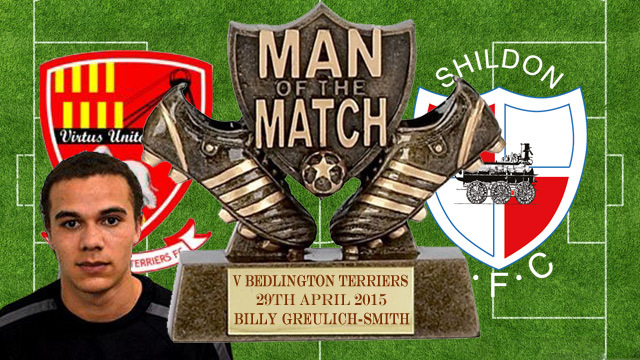 Shildon dominated play from the start with Terriers defending in numbers throughout the game. After chances from Mark Doinger, Billy Greulich-Smith and Mark Hudson, against the run of play, Terriers were ahead on 32 minutes when a through ball found Lee Scott, who looked to be well off-side, as he fired a left foot shot past keeper Lewis Graham. In the second half Shildon continued to control the play and were rewarded on 64 minutes when a cross from Ben Wood was headed home by Billy Greulich-Smith for 1 – 1. It was one way traffic as Shildon searched for the winner. Despite corner after corner and missed chances the final whistle blew and the deflated Railwaymen had failed to capitalise on their superiority. Subs: Emms for Doninger 46, Atkin for Hudson 77. Bookings: (Y) Scroggins 47, Greulich-Smith 51. A very, very disappointing result. We had 80% of the play yet failed to win the game.